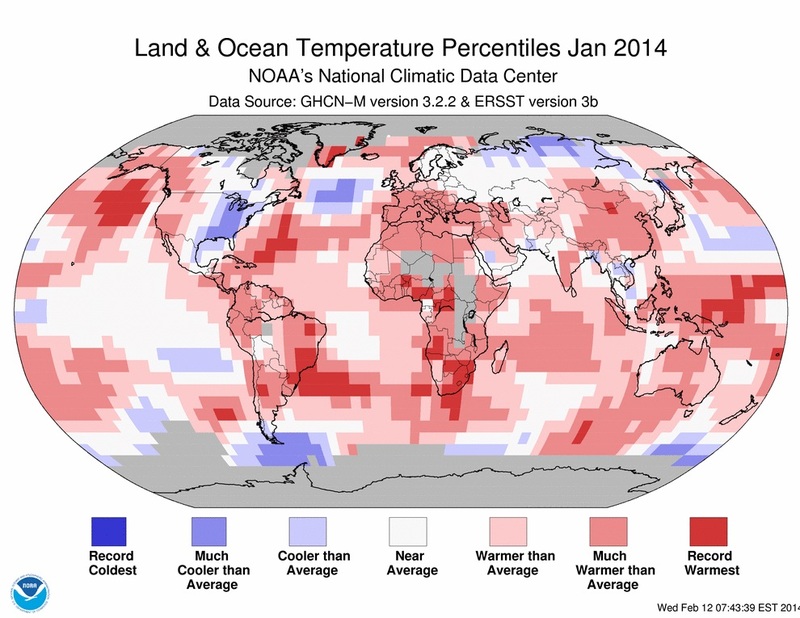 Yesterday I posted a map of the world that color coded the Earth’s temperatures for the month of January with red and pink representing warmer than normal temperatures. Most of the Earth was covered in various shades of reds and pinks. Today’s map is color coded to show areas of the United States where hydraulic fracturing has been taking place since 2005. Hydraulic Fracturing, or “fracking”, as it has become commonly known is the process of injecting water mixed with chemicals into the earth at high speeds in an effort to break up underground shale deposits in the hopes of releasing natural gas that is trapped within the shale. The gas then rises through the injecting well up to the surface where it is captured by the fracking companies and then piped or delivered to our homes so that we can all enjoy hundreds of more years of good old fossil fuel. In any case, From 1975 to 2008, the US Geological Survey found that central Oklahoma experienced one to three magntitude-3.0 earthquakes per year, That number jumped to an average of 40 a year from 2009 to 2013 and now in 2014, Oklahoma has received 25 such quakes already this year… and 150 total quakes just this week! Overall, the entire state of Oklahoma has experienced 500 earthquakes of any magnitude since Jan. 1, 2014! So what do you think could be the cause? 500 earthquakes in 2 months, in a state that has never really had earthquakes before fracking began kind of makes me think that fracking could be the reason. Try digging some holes in the ground under your home’s foundation or busting up some cinder blocks in your basement and see if your house doesn’t coincidentally start sinking or shifting around…then tell your family that it’s probably just ghosts. Anyway, fracking doesn’t just bust up the underground shale. It also uses a lot of water in the process which is contaminated with chemicals (mostly secret and toxic chemicals…are there any other kind?) as part of the process which of course makes the water unfit for human consumption…and if you look at the map, you’ll see that states like California and Texas, already experiencing monumental droughts, are states where fracking is using up valuable water supplies…and by the way, did I just say California!!! Does California really need help with enhancing its earthquake potential? And to make matters worse many of these fracking wells spill methane (which also used to be trapped underground) into the air at alarming rates, not to mention that the natural gas that we get from them is burned to create heat and energy in our homes which leads to more red spots on the climate change map. If I didn’t know any better I’d say that aliens had sent an advanced team to earth and have spent the last decade preparing for the main invasion which will begin once our planet is hot enough and crumbly enough for an easy takeover. Either that or we’re in a bad science fiction movie and this is the part where the hero finds the old video disk in the run down and forgotten library that when played explains how the misguided humans of the 21st century destroyed the planet and that’s why in the 22nd century zombies walk the earth, monkeys ride horses and octopuses swing from trees…or is that squid? But on the bright side, at least New Jersey finally has something nobody wants…and that’s a good thing! It’s been a cold, snowy winter here in the Northeast United States… so to a lot of folks that means that global warming was just a hoax…unless of course you live just about anywhere else on the planet! Sometimes we all do need to look at the “Big Picture”. What’s the weather been like where you are? Here’s another bit of anecdotal evidence concerning the gun control debate in the USA. Should we really have more guns or fewer guns? Which would make us safer? Well, if you want to ask the real experts just consider what happened when Toby Keith’s “I Love This Bar & Grill” opened in mid-December in Woodbridge, Va., outside Washington, D.C.. It seems that even though Virginia’s gun laws permit firearms in dining establishments Mr. Keith’s bar and grill has instituted a no-guns policy, which has caused some would-be customers to say that they won’t patronize the restaurant, and the restaurant’s Facebook page has drawn thousands of comments on the decision. One post announced, “If I have to be a defenseless victim to go there, NO WAY!” And another post added, “No guns allowed? Why does he [Toby Keith] hate America so much? To be fair, other posts supported the decision to make Mr. Keith’s restaurant a “gun free” zone. And in fact although Virginia’s laws allow the carrying of weapons out in the open as well as concealed firearm permits, Carrying a concealed weapon and consuming alcohol in the state of Virginia is a Class 2 misdemeanor. So go figure. Bringing your gun into a bar pretty much means that you’re asking for trouble. And that’s really all you need to know, because insurance companies are in the business of making money (and you thought it was insurance) and as such they really, really, really hate having to pay out on any insurance claims…ever… And since statistics and mathematics and actuary tables figure quite prominently into how insurance companies decide on the probability of the company having to pay out on a claim to one of their insured, they know that nothing says trouble like a person carrying a gun. Statistics tell us beyond any doubt that if a person carries a gun he or she is much more likely to shoot someone or get shot than a person who doesn’t carry a gun. And that means someone is going to get hurt, and that means someone is going to get sued, and that means that an insurance company is going to have to pay money to someone somewhere and that is bad! Forget about the fact that people are going to die or get hurt. If it means that an insurance company has to pay out on a claim, then 2nd amendment rights be damned! No guns! Because guns ARE dangerous. And more guns DOES equal more violence…not less. It’s in the numbers and the statistics and any insurance company knows that. Virginia is 17th in the U.S.when it comes to gun violence and Mr. Keith’s restaurant is located outside Washington D.C. which is #1 in gun violence! So what would you expect at a bar where everyone might decide to bring a gun and then have a few drinks? Détente?…because everyone is armed? Then you’re no insurance company. They do their research and that is why Toby Keith’s place will be gun free. Besides, if you do some research of your own about the “wild west” of days gone by, and check on the strategies of some of the most famous lawmen of that time, like Wyatt Earp, you’ll discover that when they were hired by distraught boom-town officials who wanted to stem the violence that was plaguing their citizens and townsfolk, The very first law enacted was always, “No Guns within town limits!” Wyatt Earp and his contemporaries didn’t hand out guns to make towns safer. They took away the guns! They made their towns “gun free zones”. And it worked great. That’s why the west isn’t wild anymore. It’s such a simple concept that the very idea that we are even having a debate in this country over whether we should have more guns or fewer guns is proof positive that we have all gone stark raving mad! Oh, and by the way, did you notice while reading this article that our nation’s capital is the most dangerous place in our nation?! Imagine what other countries must think? We have all of the nuclear weapons! Who among us in the USA would advocate for giving all of the other countries some of our nukes so that the world would then be a safer place in which to live? I guess maybe the other countries would…but would that make all of us safer? 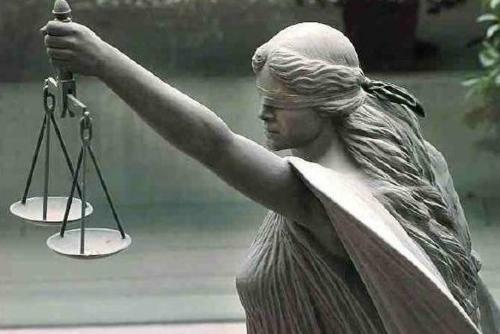 Is Justice in America, Blind, Deaf or Dumb? In 2012, A 47 year old Florida resident who carried a concealed weapons permit, along with a concealed weapon, sat in his car at a Jacksonville convenience store when 4 teenagers pulled in next to him with their rap music blaring from their car stereo. The man complained about the loud music to the teenagers and asked them to turn it down. One of the teenagers argued with the man and angry words were exchanged. The Floridian said that he felt threatened because he thought that he saw a weapon pointed at him from inside the other car so he pulled out his gun and fired 10 shots into the SUV, killing one of the teenagers. 2 years later the man was brought to trial on 1st degree murder charges and after listening to the evidence and witnesses a jury of Floridians deliberated for 30 hours over 4 days and decided that the shooter was guilty…of ATTEMPTED murder! Even though he had shot and killed a 17 year old boy, attempted murder was all they could agree upon. Wow! So, I guess it was a good thing that there were other potential victims in the SUV that he was able to attempt to murder because otherwise he would have gone home a free man…apparently in Florida the teenager that was killed doesn’t count as actually being hit with the bullet just because he happened to be shot to death. And this is what we get with more guns owned by more people who are given more rights to carry them around with additional rights to defend themselves whenever they see fit to do so. Which is exactly what our Founding Father’s hoped for the future of flintlock wielding American militiamen, and their targets, when they composed the Second Amendment…isn’t it? Still I know there are gun advocates everywhere who believe that more citizens carrying concealed weapons make for a safer world. But what we are seeing rather, is a world of aggravated, angry and now armed citizens who still do not feel really safe unless they shoot first and ask questions later. Why wait for the intruder to break into your house when you can go outside and stalk him first? Otherwise you might wind up dead! Shot by a fellow U.S. citizen with their legally concealed weapon. Unless of course a convoluted law and a confused jury say that you weren’t. Racism is dead! Long live ????? The United States of America has 5% of the world’s population and yet 25% of the world’s prisoners are in American jails. And The number of prisoners in our prison system has increased to 8 times what it was 30 years ago. And yet only 47% of our prisoners have ever been convicted of a violent crime. 6% of all white men (that’s one seventeenth) will spend time in jail. It costs 6.5 billion dollars every year to keep our prison system operating. Then how do we as American’s explain these numbers? Here is another example of how creating and administering more difficult and diligent testing does not increase performance nor create better test results in those who are tested. The United States Air Force is responsible for training and overseeing the “missileers” who man the underground bunkers across the country and who operate our strategic defenses in case of nuclear attack. The missileers are the military airmen who are responsible for reading the launch codes and standing at the ready of our ICBM force around the clock should they ever be needed to…you know…push the buttons. For about a decade now the United States ICBM force has been performing at less than optimum proficiency… and that’s according to the Unites States Air force. Apparently many of the missileers have been showing signs of greater stress and boredom and have been performing at less than their usual proficiency, dexterity and alertness. So how is the air force doing with its upgraded testing program? This past January, 92 of the 200 airmen who operate ICBMs at a Montana base were caught cheating or were involved in the cheating on their monthly proficiency tests, by using their cell phones to share answers. And supposedly this is nothing new but rather a practice that has been going on for years. It seems that the tougher the tests got, the more cheating became necessary. But why didn’t the airmen just study and work harder to do better on the tests? Because the missileers, mostly young officers who did not volunteer for the program, apparently know something that their older commanders still fail to acknowledge…The Cold War if over! Their job is obsolete! No matter how many missile codes they memorize and no matter how hard they study, no one is ever going to ask them to blow up the world with ICBMs anymore! So spending countless hours underground, for days on end, being diligent and proficient in a skill that they are not going to use nor be asked to use, seems a bit silly to them… and studying to be promoted in this useless proficiency, seems even sillier. In fact, guess what happens to the airmen if they fail the test or get caught cheating at it? They get decertified and can’t go down into the underground silos!… And those who pass?… They get to work double shifts! So how do we fix this dilemma?…More difficult tests of course. But wait, you say! Don’t we need these warriors with their arcane skills and outdated missile system to stay sharp… just in case we need to blow Russia or China or somewhere else off the map…you know… just in case? Well, maybe you and I and the joint chiefs think so but it’s getting harder and harder to convince the younger generations of that…and besides we still have 14 Ohio-class submarines loaded with nuclear missiles and patrolling the oceans day and night, pretty much unopposed by any other navy…not to mention the 60 B-2 and B-52 bombers on constant alert around the globe, loaded with world ending nuclear weapons too of course…and unopposed by any other air force. I wonder if those young, well trained, sailors, soldiers and airmen are getting bored too? So what do you think? More testing? Or is it time for all of us to put down the old tests and start learning something new? 1.Does the Earth go around the Sun, or the Sun go around the Earth; and how long does this journey take? 2.Did Zack Galifianakis appear in the movie The Hangover; and did he appear in a sequel to that movie? Odds are that if these questions were asked as part of a national survey, question #2 would receive more correct responses than question #1, because in a recent survey conducted by the National Science Foundation only 73% of those surveyed knew that the Earth revolves around the sun…and of those only 71% also knew that it takes 1 year for the Earth to complete said journey. Wow! And why do we suppose that is? Is it because only 74% of America’s science teachers in America’s public schools have ever mentioned or illustrated this amazing fact to America’s students? Is it because only 74% of America’s parents have ever had “that talk” with their children about where the sun goes at night? Is it because we are a Christian country and as such only 74 of us will ever believe in both god and science? So 20 years ago one quarter of those surveyed did not know that the Earth revolves around the sun…and 20 years later one quarter of the U.S. population still doesn’t know this simple and basic fact…nor have any of the other questions received any significant increase in the number of correct responses. And no matter how many standardized tests we gave them…and no matter how important we told them these tests were…and no matter how many times we revised the curriculum…and no matter how many times we developed new and improved learning strategies…and no matter how many times we replaced the Superintendent and Principal or revamped the teaching staff or asked the parents to please get involved or threatened the students with failure and the withholding of diplomas…or declared nationally that we would “Leave No Child Behind”…their test scores little improved. I’m willing to bet that just about every American knows that the Earth goes around the sun. It’s just that a certain percentage of us just don’t see the importance of remembering that fact or in paying attention to someone who wants to ask us such a stupid question to see if we know it. Does the Earth or Sun care? They’re still going to be doing their thing whether I answer that question correctly or not, right? And don’t you have something better to do than ask me that? We’re Americans after all…and we’re busy! We’re a nation of seriously professional consumers who have been trained literally from birth to buy and sell and entertain and be entertained and consume and waste and innovate and reinvent and get bored if all of that takes too long. The question and answer test, especially in pencil. paper and booklet form, is just no longer relevant to the 21st century world and I believe that we 20th century minded educators are the ones who have to get out of the way and stop worrying about numbers on tests as the only way to discern and/or prove whether or not learning is taking place. Here’s the National Science Foundation’s test. Take it and see how well you score. Then ask yourself how many times these answers were given to you over the course of your lifetime by your teachers and parents and how many times these topics were probably covered during your schooling or lifetime… And then ask yourself if how well you did or did not just score on this test has any bearing or relevance to your present life or living conditions, even if it once did. When you’re playing on your X-Box do you really need to still be tested on your Atari skills? If you score better than a 7 on the following test then…you’re not average…and maybe even not American? True or False: The center of the Earth is very hot. True or False: The continents on which we live have been moving their locations for millions of years and will continue to move in the future. Does the Earth go around the Sun, or the Sun go around the Earth; and how long does this journey take? True or False: All radioactivity is man-made. True or False: Electrons are smaller than atoms. True or False: Lasers work by focusing sound waves. True or False: The universe began with a huge explosion. True or False: It is the father’s gene that decides whether the baby is a boy or a girl. True or False: Antibiotics kill viruses as well as bacteria. True or False: Human beings, as we know them today, developed from earlier species of animals.